Medial collateral ligament (MCL) injuries are one of the most common ligamentous injuries of the knee. The extent of injury can range from a minor first-degree (1°) sprain to an extensive third-degree (3°) sprain that can propagate across the knee, rupturing both cruciate ligaments and result in a complete knee dislocation. 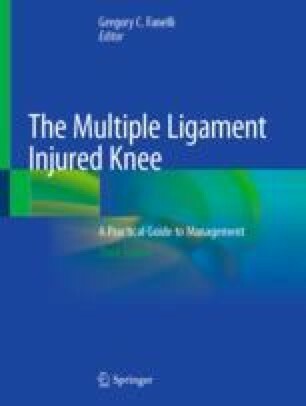 A common pattern involves the combined anterior cruciate ligament (ACL) and MCL injury that is the focus of this chapter. The vast majority of these combined medial-sided injuries are treated non-operatively with delayed reconstruction of the ACL injury in athletically active individuals. The MCL and associated medial structures need to be carefully assessed on physical exam and classification of injury is based upon abnormal limits of joint motion. In vitro cadaveric biomechanical testing has given us a better understanding of ligament deficiency and altered joint motion. Magnetic resonance imaging (MRI) is crucial to assess the extent of structural damage and zone of injury. Consistency in terminology is necessary for proper classification of injury and reproducible categorization of injury patterns in order to be able to compare non-operative and operative treatments of various injury patterns. Recently validated in vitro studies allow for the first biomechanically justified medial ligamentous reconstructive technique.